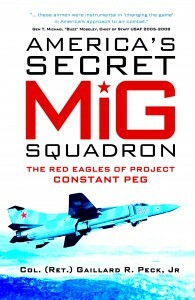 America’s Secret MiG Squadron is Now On Sale! – Gaillard Peck, Jr.
You are here: Home › MiG Squadron News › America’s Secret MiG Squadron is Now On Sale! America’s Secret MiG Squadron is Now On Sale! Today is an extremely exciting day for me–my memoir about Constant Peg and the 4477th TEF went on sale at midnight this morning! You can pick up your copy wherever books are sold!